So, work has begun on the solar panel. The company turned up, and spent an hour looking at the roof. Access is really tricky. There’s a car-port preventing them putting a ladder straight up to the south-facing roof. 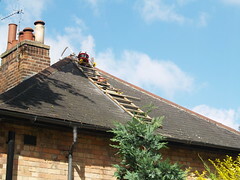 Eventually, they decide the easiest way, short of entirely removing the car port then replacing it, is to go up into the attic, out through the sky-light and clamber over the roof to the panel. By the end of the second day, they have fitted the top part and some of the tubes. Because they only have access to the top of the panel, and not the bottom from a ladder of platform, it’s slow progress. 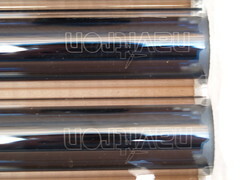 Here’s what the tubes look like close up. They’re longer than I am tall – but once they’re up on the roof, they don’t look nearly so big. The panel was completed by the end of Thursday – but so far it’s not connected to anything inside! Work continues next week – replacing the hot water tank, moving the header tank, plumbing in a new shower, connecting the controls, lagging the pipes. 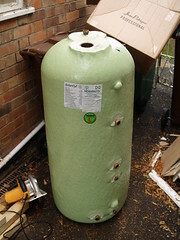 Here’s a picture of the new tank – with a wheelie bin in the background for size comparison pictures. 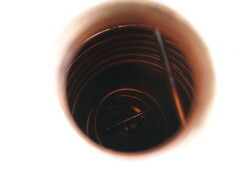 And here’s a picture taken through the hole in the top where the immersion heater goes. I love this picture. You can clearly see both coils – a larger one around the middle which will be connected to the ordinary boiler, and a smaller one with fins around the bottom, which will be connected to the solar panel. This entry was posted in House, Politics and tagged solar panel. Wonder how your installation company got around the need to use scaffolding? All new buildings and public buildings should have solar heating installed. It may take 10 years to pay for itself but most buildings last a bit longer than that! Different temps – main use will be through a shower with a thermostatic control. The controller will stop it getting too hot, and if it’s too cold, the gas central heating will give it a top-up every evening. So it should be a reasonably constant temp. I’ve long been calling for all new building to have a sustainable element to their construction. Putting in green measures at the time of construction is much more cost effective than trying to fit them later. And not just solar hot water, but geothermal heat pumps, world class insulation and systems for flushing toilets with rainwater need all to be considered. 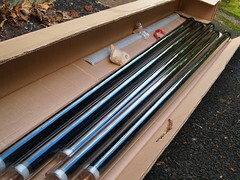 Hi I am thinking of getting solar panals, do you recommend them? Are they saving you money? If so how much have you energy costs been reduced by? 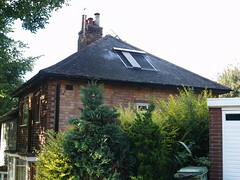 My solar panel generates around £150-worth a year of heat, and so will probably take around 30 years to pay for itself. New deals are now available that make photovoltaic solar panels, which generate electricity, a more financially viable option. Whether solar hot water is right for you depends on several factors, including planning to be living in your house for several decades, having a roof that points in the right direction (south! ), and having the right kind of boiler – not a condensing boiler that provides hot water on demand, but a system that includes a hot water tank. The Coalition government is preparing a Green New Deal that will provide advice and finance for greening your house, so it might be worth waiting until the details of that become clearer before making any decisions. 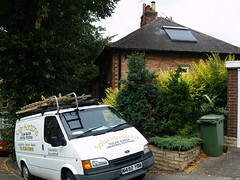 If you live in Notts or Derbyshire and you’d like to talk to someone about solar hot water, get someone to look over your house and check suitability, and get referrals to local people who can install them, give Sungain / Notts Energy Partnership a call on 0115 985 9057.